The #SundaySupper crew is proud to again be sharing our interpretations of some of the amazing recipes from The Mom 100 Cookbook by Katie Workman. I could not participate the first time, but since I heard about the first even, I picked up my own copy and began perusing it. Katie is all about providing her kids, and help you give your, healthy and delicious food that isn’t overly complicated. And she talks about taking steps to make new flavors and cuisines more approachable and acceptable to even the picky eaters. Now, as you have seen, The Bug certainly doesn’t fall into the picky eater category. Yes, there are plenty of things he won’t eat, like string beans, tomatoes that are not in sauce or ketchup form, toast (which he recently declared as “yucky!”), and cold cuts. But he is pretty adventurous. While Mexican food is his favorite, Asian comes in a close second. He loves stir frys, teriyaki and soy sauce, dumplings, you name it. So Katie’s Sesame Noodles aren’t really a stretch for him, but a Thai-inspired meal may not be part of every kid’s list of favorites. But pasta covered in a sauce made out of peanut butter – I don’t think most kids would turn that down. As many of you know, I have a wheat allergy, so I try to stay away from gluten most of the time. 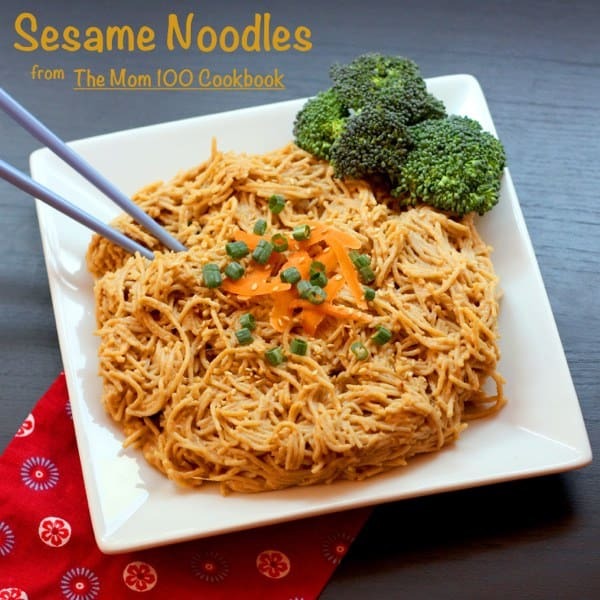 But I love Sesame Noodles, and Katie’s sounded like a wonderful and crazy easy recipe, so I wanted to make a gluten-free version. This was simple enough, in this case – tamari instead of soy sauce (or you could use one of the gluten-free brands of soy sauce), and gluten-free noodles. I have only made gluten-free noodles a couple of times, and think I need to work on erring on the side of undercooking, because they do get a little soft. Honestly, I didn’t mind – easier to pick up with chopsticks! But you won’t have this problem if you cook your gluten-free noodles a little less than I did, use thicker noodles (I had thin spaghetti on hand), or use regular pasta. Also, not that this is gluten-free, but I also use 1 T coconut oil in place of 1 T of the canola oil, and I think I’d like to substitute the entire amount next time, as I think the slight hint of coconut flavor lends itself well to the Thai flavors. Oh, and I am like 95% sure that I completely forgot to add the brown sugar, so I am listing that as optional. We loved it, even without it, though I am sure it adds a nice sweetness to the bold flavors in the sauce. But if you want to keep added and/or unrefined sugars out of this meal, it will still be wonderful. Also, it was clearly one of those days – I forgot to toss the cooked pasta with a little sesame oil, as per Katie’s directions, so, since I made the noodles in advance, they absorbed quite a bit of the sauce. They just needed a splash of water and a few second in the microwave to “revive” them. This was a super-easy meal to prepare in advance. Early in the day, I whizzed up the sauce in my Magic Bullet. Later on, I tossed the sauce with the pasta. Then right before serving, I cooked up some shrimp and broccoli. Katie gives a number of suggestions for what to add in or serve with the noodles. I topped them with a little chopped scallions, shaved carrots, and sesame seeds. Then, since gluten-free pasta usually comes in an 8oz. package, I only put half of the sauce on the noodles, and we used the rest for drizzling over some steamed broccoli and sautéed shrimp. The Bug was such a huge fan of these noodles, and The Hubby and I could not stop raving about them. The little guy devoured them for dinner, and polished off the leftovers for lunch the next day. This recipe is a total keeper! It WILL become part of our regular rotation. I think I want to make it with some Thai-style rice noodles, and turn it into a Pad Thai. Make sure you check out all of the recipes below that the #SundaySupper gang has cooked up from The Mom 100 Cookbook. As usual, #SundaySupper starts at 3:00pm EST by showcasing fabulous recipes and casually chatting. Follow us on twitter by using hashtag #Sundaysupper or using Tweetchat. We love to feature your recipes on our #sundaysupper pinterest board and share them with all our followers. But this week, we are lucky to have a twitter chat with Katie herself at 7:00 pm est. Join us and chat with Katie about being a mom, kids and Spending time Around the Family Table. Even more exciting, we will be giving away 3 copies of the Mom 100 Cookbooks. This is an event you don’t want to miss!! 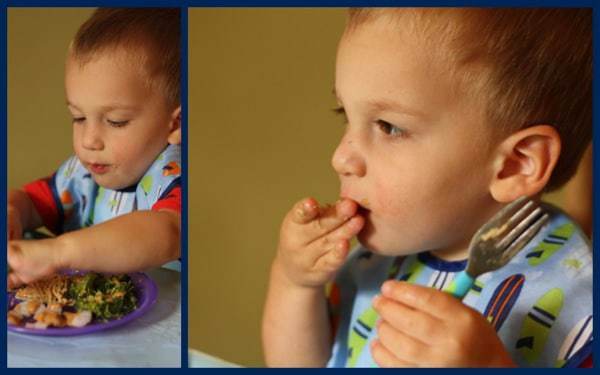 How do you introduce new flavors and cuisines to your kids? Chopped scallions toasted sesame seeds, fresh cilantro. Make the sesame sauce: Place the ginger and garlic into a food processor or a blender and run the machine until they are finely minced. Add the brown sugar, peanut butter, vinegar, soy sauce, hot sauce, vegetable oil, and 1 tablespoon of sesame oil. Process until smooth and reserve the sesame sauce in the food processor. Prepare the noodles: Bring a large pot of water to a boil over high heat. Add salt and let the water return to a boil. Add the noodles and cooking them according to the package directions until just tender. Set aside 1 cup of the noodle cooking water, then drain the noodles. Rinse them quickly with warm warm and drain again. Let the noodles cool to room temperature; they will absorb more sauce as they sit. Mix in any add-ins, like chicken, shrimp, broccoli, cucumbers, carrots, etc., and/or garnish as desired. 1 - I accidentally omitted this, and it was still delicious, so I would call it optional. 2 - I used natural peanut butter with no issues. 3 - I used tamari, or you could use on of the brands of gluten-free soy sauce if you are making the gluten-free version. 4 - I used 1 T coconut oil and 2 T canola oil. I would like to try all coconut oil next time. 6 - If you are only making 8 oz. of pasta, divide the sauce in half before adding 1/2 c of cooking water. Use the rest as a dip or drizzling sauce (after thinning slightly) for veggies or shrimp. I wonder if I could swap out the peanut butter for sun butter? We have a peanut allergy in the house…. I bet it would work. If you try it, let me know. I’d love to let my readers know of a peanut-free option! I did and it was really good! I ended up making my own sun-butter (using this lady’s recipe: http://prudentbaby.com/2011/08/entertaining-food/how-to-make-sunbutter-the-best-sunflower-butter-recipe-2/) and thought it tasted great! It was a last-minute thing so I didn’t even have any toppings, which obviously would have made the noodles even better, but the sauce was delicious and I thought it totally worked with sun butter!! It was an awesome recipe! 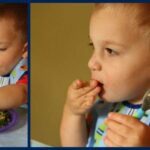 Breakfast is actually the easiest meal for me – my little guy likes pretty much any breakfast food. Beautiful recipe and gorgeous photography. Thank you for your #SundaySupper inspiration. Thank you, and thanks for introducing me to Katie and her awesome book! Love the siracha and dark sesame oil in this! It really does add such an interesting and complex flavor to a simple dish. These look so good! I love sesame noodles and carrots are one of my fav toppings. Can’t wait to try this version! Amazing sesame noodles! I must make this soon. Glad to share Sunday Supper with you! If he can take the strong flavors of Mexican, then he should like Asian, too. I think this recipe is a good one to start with, though my little guy likes simple teriyaki chicken and broccoli. WOW your photos are gorgeous! You son, oh my so adorable. We are fans of Asian noodles too. I so have to try Katie’s recipe. Thanks so much! This is one of the easiest versions of this recipe I have seen! Ok that’s it, too many people have made this dish and every time I see it I want to make it but don’t! It’s a MUST on my list now!! Do it!! You won’t be disappointed! Love your gluten free version! This will be perfect to make for my nephew! This was an easy one to make gluten-free, and so I wanted to show people that! Mmmmmm these noodles look amazing! Love that they’re gluten-free! Of course, you don’t have to make the gluten-free, but it definitely works well. Your kid really does eat everything! I discovered sesame noodles not long ago and am a total fan now! Love the addition of peanut butter and brown sugar. He does love a lot of things! The peanut butter adds a nice flavor, though I am curious to try tahini to make it really seasme-y! I’m totally stealing from you and Renee and making these noodles tonight! Give me a big plate of these noodles anytime! Any add-in would just make it even better! I know, I think I could have eaten the entire batch myself! Oh, I’m glad to hear that this was so well received because I have it marked to make soon. Thanks for your recommendations…I wish I already had some to eat! You could have some in no time! Super-easy! Great idea to make this gluten-free. I know a few people who need recipes like this. Thanks for sharing today for #SundaySupper. So many people think eating gluten-free is having any pre-packaged, processed stuff with “gluten-free” on the label, which usually taste like cardboard. I love to show people “real” gluten free food that doesn’t require much change in how you usually cook, or really obscure ingredients. Gluten-free noodles are pretty easy to fin now, or you could just use rice noodles you find in the Asian section.